Home » Decorating Resources -- Also note those subcategories in the orange navigation, above! 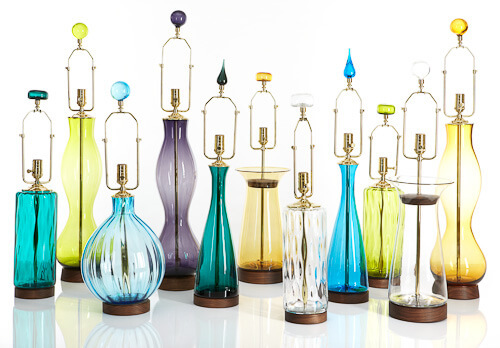 » 20 dazzling vintage table lamps — Moss, Majestic and more! Above: Reader Dave‘s shapely table lamp has two perfectly coordinated shades — one of which must be very nice for reading. Beautiful — and functional! 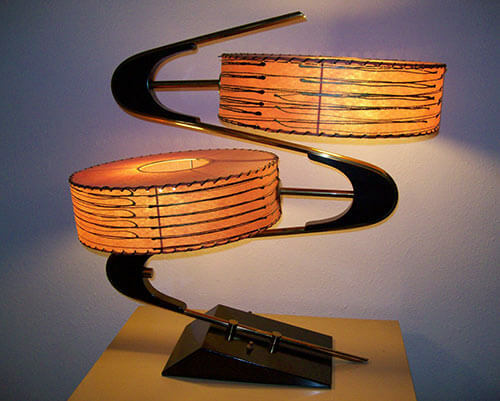 The curvy, two tiered shade of this retro starburst lamp is part of what makes it unique. Well… that and the twin snakelike blue lightbulbs that seem to slither from behind the metal burst of sputnik- inspired awesomeness. Mystery reader #1. The three-tiered shade of the lamp above is what caught my eye — but the shape, texture and minty green color of this lamp kept me staring. Mystery reader #2. 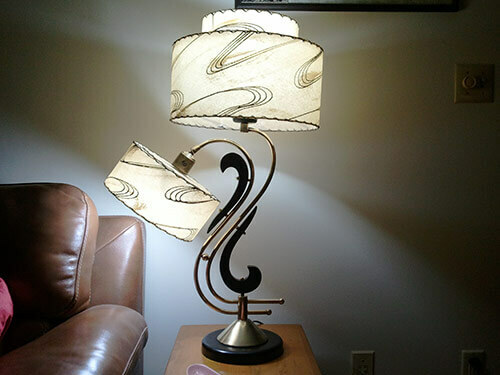 Here’s another retro fabulous shapely lamp and shade — from reader Sparkleneely — who admits this lamp is their favorite possession. It is easy to see why — the shade an interesting shape, and the metal starburst ornaments that adorn this lamp really make is special. The nightlight-sized bulb on the right side of the lamp provides a lovely glow for the dancing figurines that accompany this artistic lamp. Were the lamp and figurines sold as a set?? There is so much going on with this Moss lamp it is hard to know where to start. 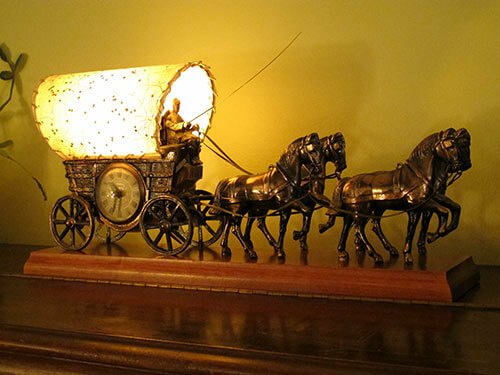 Five different light sources, quite possibly the most tailored lamp shade ever, a fancy figurine, decorative bulbs and a whole lotta starburst power — YOWZA. Vintage Moss and Majestics sell for a lot o’ green. Mystery reader #3. The fun and feminine pink lamp above submitted by reader Olive M — is just lovely. 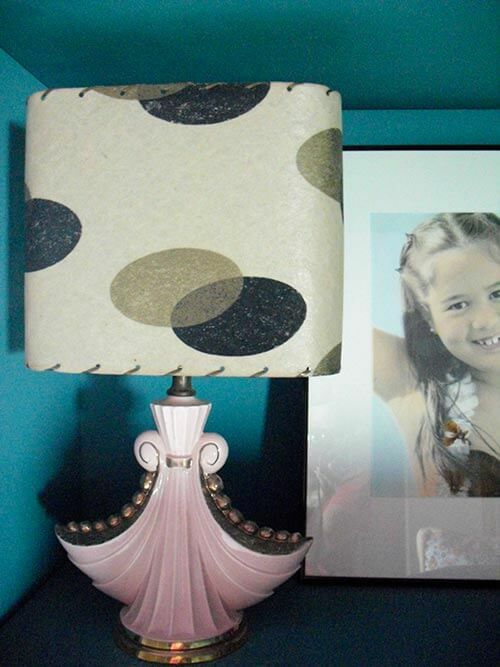 The combination of the frilly dress-like base and the narrow polka dotted lamp make this one of my favorites. This 1958 Magestic Z lamp is quite the specimen. 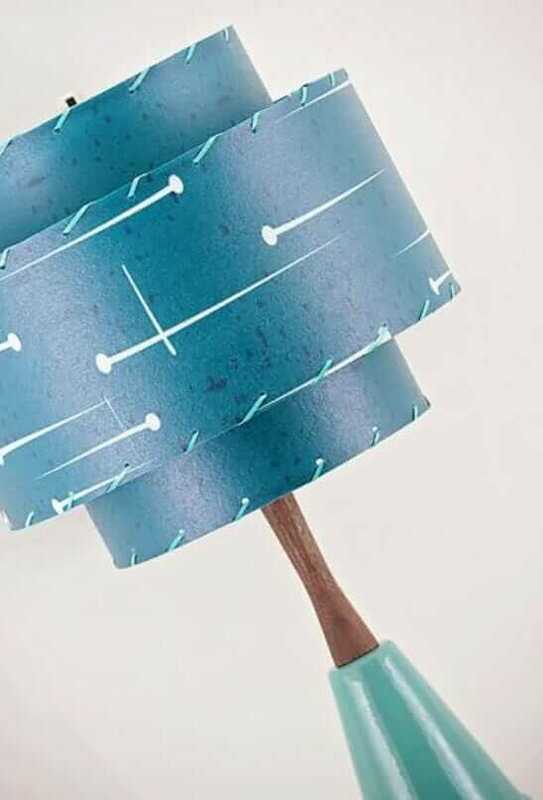 There is such movement in this style of lamp, and the drum shades are really special. Mystery reader #4. Above is yet another example of how undeniably cool tailored, asymmetrical lamp shades can be. I love the angles of this lamp shade and the position of the four decorative bulbs. Also interesting is the print on the white part of the shade — small dots and scribbles. Mystery reader #5. 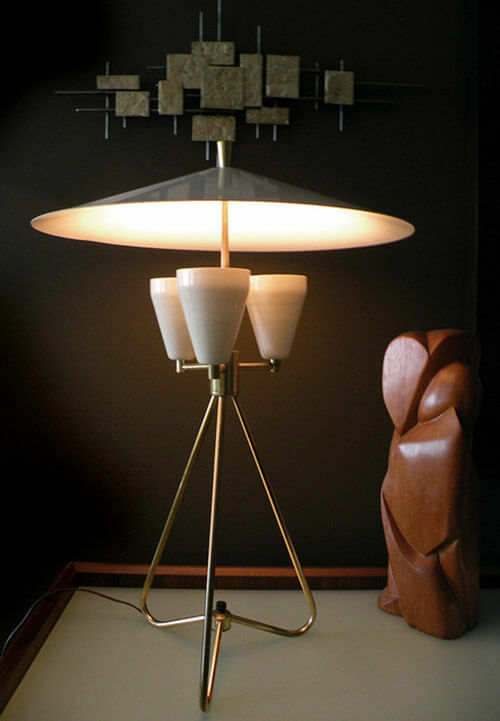 The mid century modern table lamp above — from reader MadModern — is super cool. The top is wide and sleek. In combination with the three cones it looks very much like a UFO. The base is the most interesting part to me — almost a hairpin configuration with the on/off switch right in the center. Brilliant design. 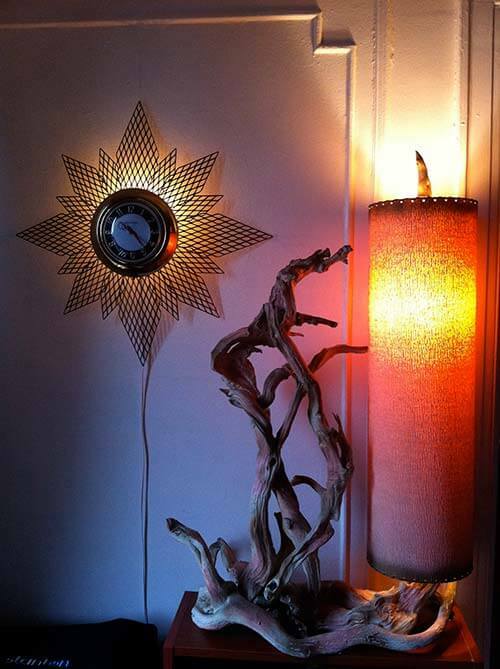 This driftwood 1950s lamp is gnarly, dude! In a beautiful way, of course: The organic shape of the driftwood keeps my eye moving and interested. It almost seems like the driftwood is alive and holding the shade as a lantern to see into the night. Spooky. Notice: The clock on the wall behind this lamp lights up, too. Mystery reader #6. This TV lamp/clock from reader Luann is really something — Luann’s father-in-law got this for his parents for Christmas back in 1967. Luann says the driver’s whip is functional, too. Such amazing detail from an amazing light source. I would be terrified to see a viking ship like this one approaching my couch if I were reader BetaMike — although since it seems to be under the control of the adorable kangaroo ceramic piece sitting next to it — I won’t be too worried. 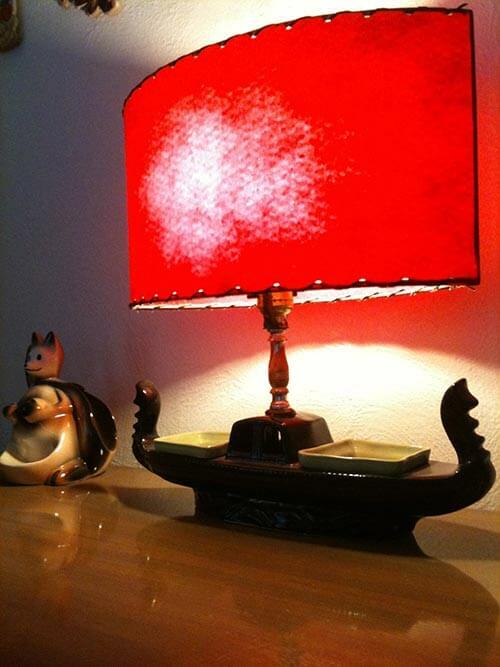 Looks like there are some cargo holds in this viking ship lamp — perhaps the perfect place for a candy stash? I think this may be considered a TV lamp. 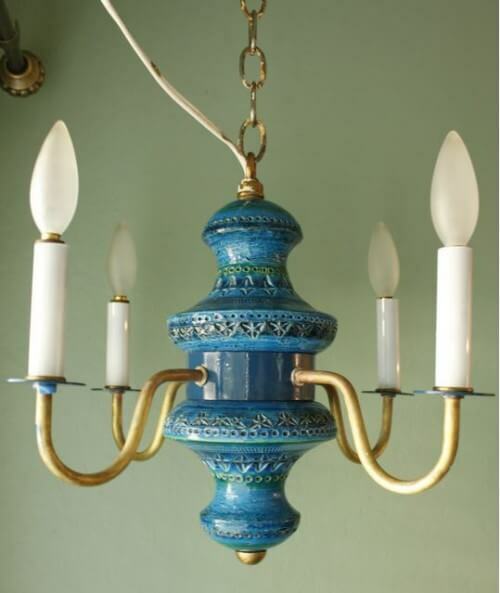 Remember Pam’s story about the wall of 14 vintage TV lamps at the Red Lion Inn? 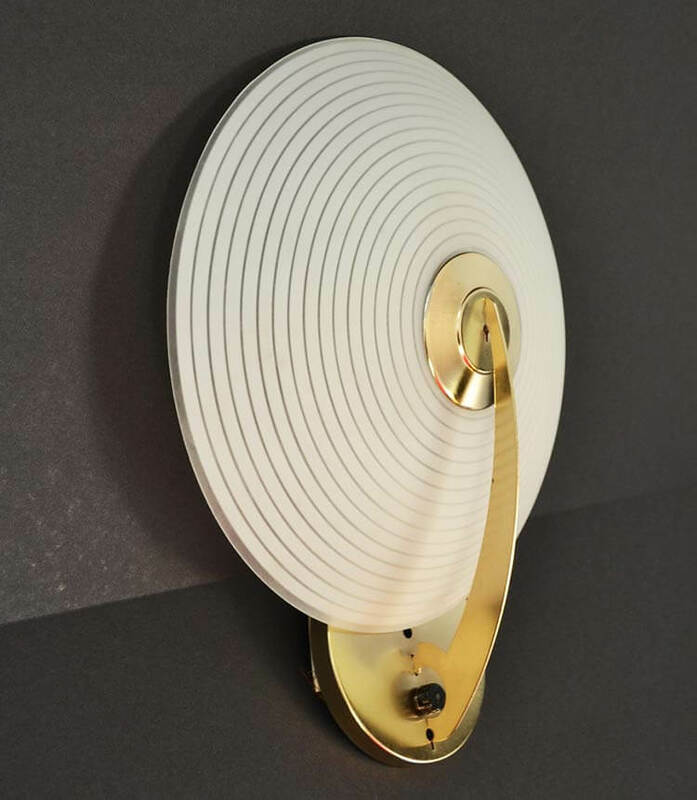 It’s a phone — no, it’s a clock — no, it’s a lamp. However you want to categorize this aqua bit of retro coolness, I’m sure readers Rob & Monica love this unique bit of decorating history. The four-tiered matching aqua shade is a fun touch, too. Looking closely at this lamp from reader Elena S. — I am puzzled about the original purpose of the glass orb hanging from the center of the base. Is it be a planter? A vase? An incense burner? I have never seen anything like that before. Elena S., did it come with the plastic bouquet, or did you add them? 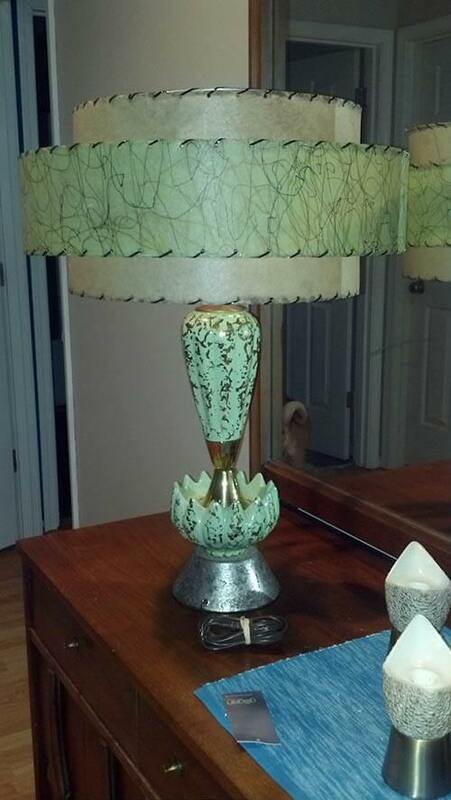 The pagoda style shade on this vintage table lamp — Moss? Majestic? — is quite impressive. Underneath the pagoda a small figure sits on a bench — or is that a movable swing? 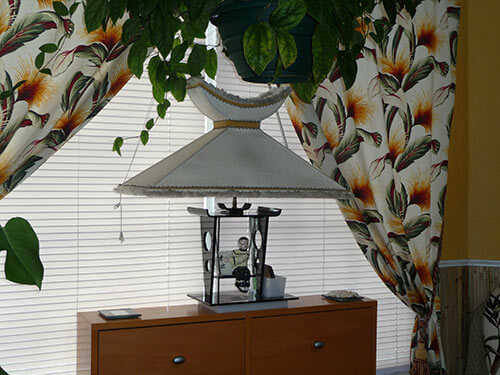 Yes, this lamp is so beautiful, it is showcased like a work of art, framed by coordinating draperies, in front of a prominent window. Nicely played, Mystery Reader #7! 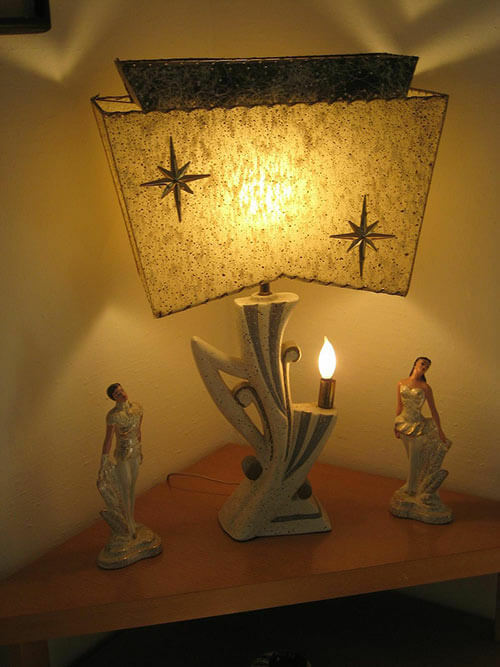 The king lives on in this charming table lamp from reader Katherine. 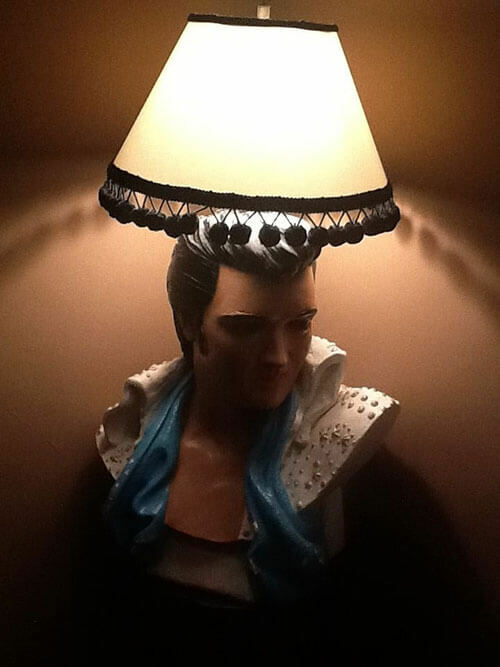 Katherine says she received this Elvis lamp as a birthday gift when she lived in Kentucky and decided it was among the few possessions that would make the move to Paris, France, with her. The black-and-white pom pom shade that hovers over Elvis’ head really is the crowing touch. 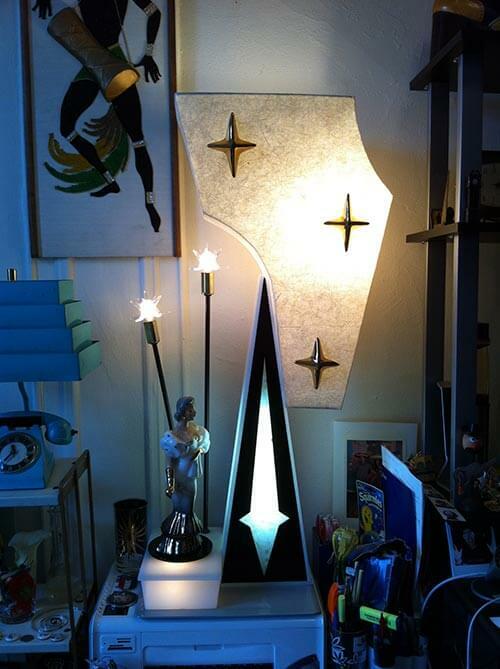 Reader LarsErik’s 1964 Buck Rogers rocket ship lamp is the ultimate atomic table lamp. This is fabulous! 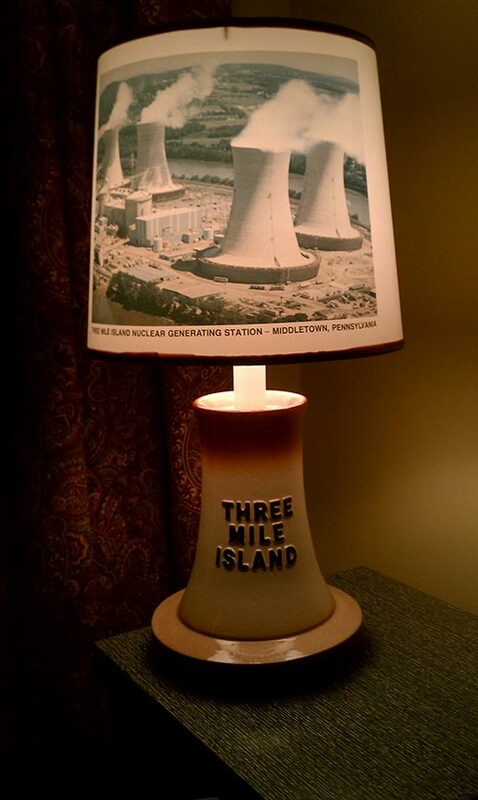 Seeing reader Pia’s Three Mile Island nuclear reactor lamp brought back memories. My 9th grade school field trip was to Washington, DC. Along the way we stopped at — you guessed it — Three Mile Island. Words cannot express the bundle of sheer joy that this final wacky and wonderful lamp possesses. 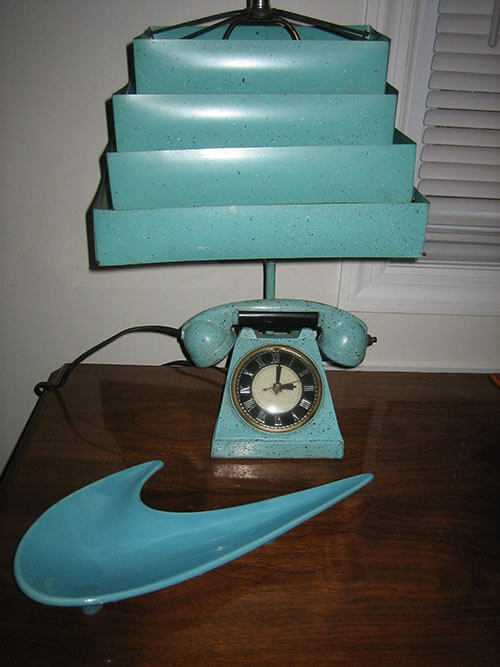 Reader Barb S. must never be sad when she can relax by the blue glow if this ferny vintage TV lamp. Her caption on the uploader was, “NEVER enough acrylic lamps” begging the question — are there more of these in existence? Mega thanks to everyone who participated in the table lamp uploader. 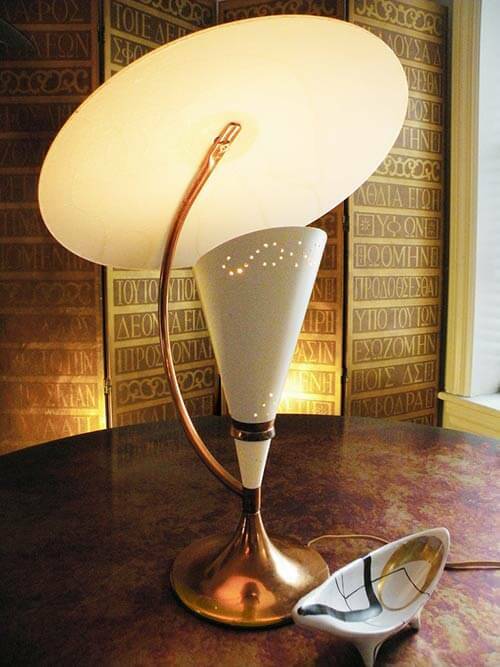 There are more awesome retro lamp species out there than I could have ever imagined. See all 366 lamps in the reader uploader here. 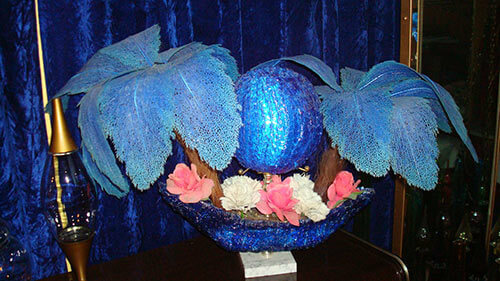 Want to buy fiberglass lampshades? Check these out shades from places like Modilumi (shown above) and Meteor Lights. The hanging globe on my lamp appears to be a planter. It came with the plastic flowers pictured. We’ve had many a discussion on its purpose. Thanks for the extra info on your lamp Elena S! It is quite unusual. Not an easy task I revisited the lamps just the other night and ended up spending hours looking at the fine detail. There was just such variety,imagination and beauty in all the lamps. J D, how curious – so was I! 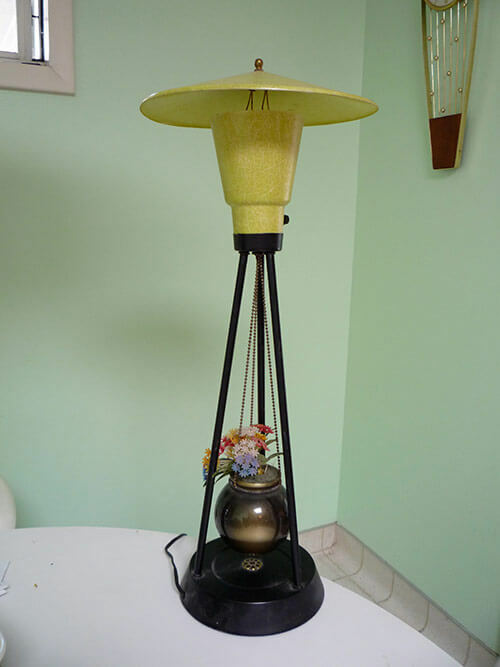 I saw this lamp on ebay and had to go look at all the wonderful lamps again. Shoulda bought it! I just love the shade! What eye candy!!! Could look at these forever! Lamps are really boring now! 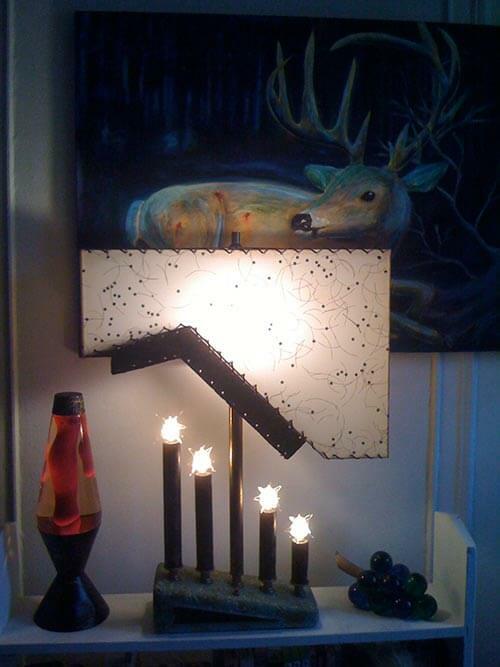 Wow those are some crazy/awesome lamps! 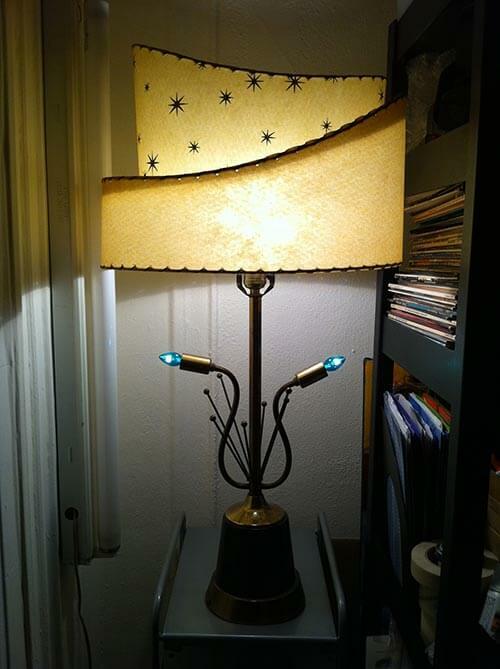 Makes me feel sad about my boring ikea lamps… I will definitely be on the lookout for something more fun! These are so astoundingly gorgeous, but the one that really dropped my jaw was Three Mile Island. Ah, the days when souvenirs were built to last!